Les Mis is my favorite book and I cry every time I watch the three hour 2012 adaptation, which is more often than I’m willing to admit. That being said, I don’t know an awful lot about French politics. I do know, however, that a country’s sovereignty matters, and that mass migration is failing the western world. 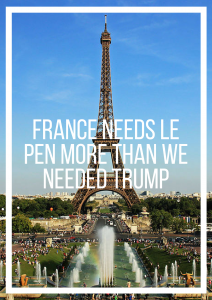 I’ve been following the French presidential election for months now, and while I’m no expert, I think that France needs Le Pen. Once again, I’m no expert, but I don’t hate Macron. I’m extremely skeptical (what kind of socialist becomes an investment banker?) and opposed to many of his proposals, but he has some great ideas. For example, his proposed cut in corporate tax rates and regulation roll backs are music to my conservative, capitalist ears. But he is wrong on issues far too important to overlook. In 2015 alone, over 200 terrorist attacks were carried out in the European Union. CNN reported a 650% increase in only a year in November of 2016, with France being one of the countries most affected. Just 3 days before the most recent round in elections, an armed terrorist killed one police officer and seriously injured another. Macron’s response? Come again? I can’t speak for the French, but someone running for the presidency of my country that refers to the threat of terror as a “fact of daily life” has not only lost his mind, but my vote. Nations deserve to control their borders and moderate their immigration policies as they see fit and for the benefit of its citizens. The fact that this has become a partisan issue or is constantly in hysterical extremes is both astonishing and pathetic. The issue of national security is not one that can be overstated. With France’s strict gun control making it virtually impossible for law abiding citizens to get their hands on firearms, and terrorists weaponizing trucks, guns can’t be the scapegoat. The developed world can’t continue to accept droves of people from countries with high terrorist activity, then get caught looking like a deer in headlights when another flag filter appears on Facebook and another #PrayFor hashtag appears on Twitter. There is absolutely more terrorism than the terrorism that has become so sensationalized within the past decade in a half. Terrorists can come from any religion, race or region. I hate American terrorists as much as I hate foreign terrorists. But if anything can be done to prevent more terror attacks on my soil, you better believe I’ll vote for that. I feel for people caught in the middle of turmoil they had nothing to do with, that desperately want their lives to return to normalcy. But I expect my government to put me first, and France’s government to put their citizens first. Neither America nor France can afford to turn a blind eye to the suicidal nature of unrestricted immigration from these turbulent, war-torn countries and little to no ability to properly vet. 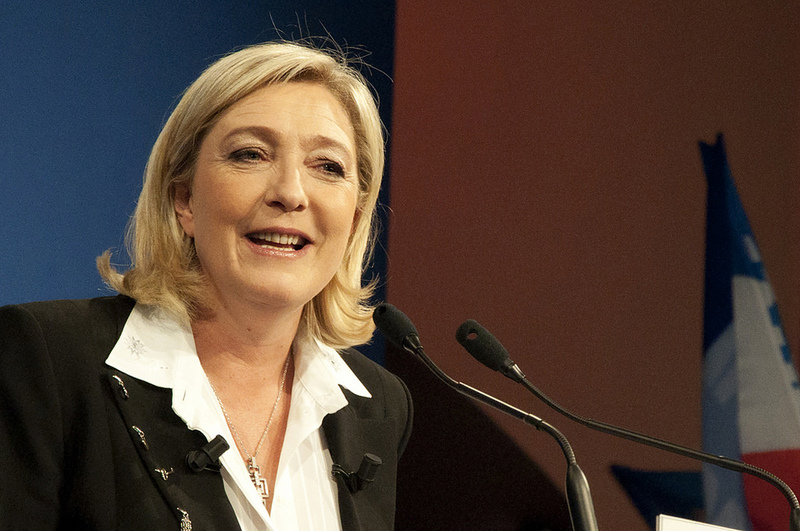 Le Pen is no saint. She has embarrassed herself, her party and her country more than once with her poorly assessed comments. But if there’s anything that the 2016 election has taught us, it’s that some things are more important than a moment of bad judgment or a crass remark. And national security is one of them.